Through the work of a 32-member Study Group and assistance from a 13-member Advisory Committee made of experts in the arts and education fields in Pennsylvania, The Education Policy and Leadership Center’s Arts and Education Initiative studied the arts and education landscape in the state and developed 33 recommendations for policymakers and other key arts and education audiences to improve arts education access and quality. 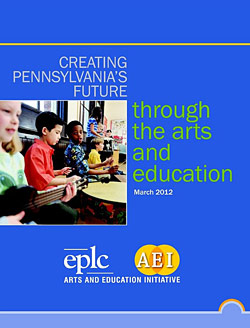 These findings and recommendations are featured in EPLC’s Arts and Education Policy Report: Creating Pennsylvania’s Future Through the Arts and Education. EPLC is building capacity within the arts community for effective policy advocacy at the state and local levels through the Pennsylvania Arts Education Network, which will help to support the Report’s recommendations.